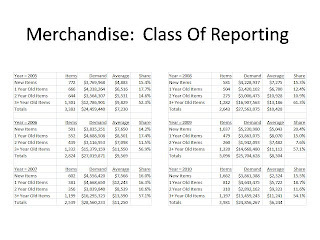 Do you look at the productivity of your merchandise offering by a methodology called "Class Of"? Identify the first year each item was made available to a customer. For each of the past six years, create four merchandise segments ... item offered for first time ever this year ... item was first offered one year ago ... item was first offered two years ago ... item was first offered three or more years ago. 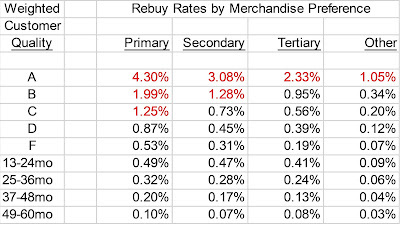 Sum total demand for each of the merchandise segments. Sum number of items in each merchandise segment. Measure productivity (demand / items), or use profitability or gross margin, your choice. Clearly, leadership made a dramatic change in 2009, implementing a strategy to introduce many new items. Now, take a look at productivity ... demand per item. 2005 = $4,883 per item. 2006 = $7,650 per item. 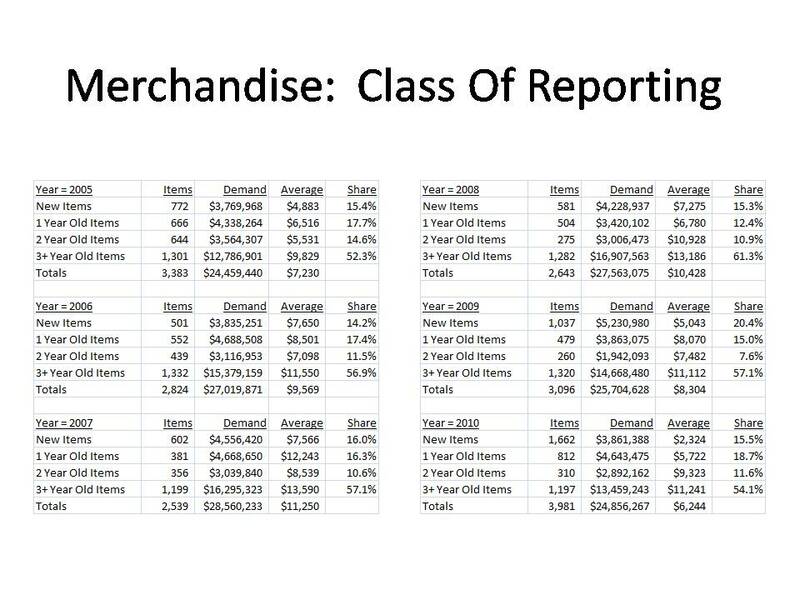 2007 = $7,566 per item. 2008 = $7,275 per item. 2009 = $5,043 per item. 2010 = $2,324 per item. As items proliferated in 2009 and 2010, productivity per item collapsed. In total, here's total demand from new items, by year. Compare 2008 to 2010. Clearly, somebody made it an initiative to ramp up development of new items, nearly tripling the number. And yet, total demand from new items is almost 10% below the levels of two years ago. There are several critical elements in merchandising. Drive tremendous profit from existing items. Use the profit generated by existing items to fuel research and development (new items). Introduce enough new items to make sure that there are "winners", products that will deliver tremendous profit potential in the future. 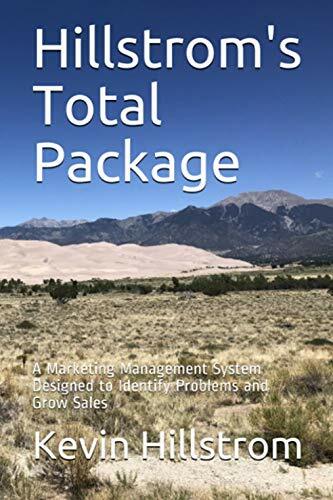 Effectively manage product cannibalization so that productivity per item is sufficient to increase both demand and profit. This business took a 20% productivity hit from existing items in 2009 (just like in many businesses). This business took a dramatic productivity hit from new items. This does not bode well for the future, because the productivity of items does not dramatically change over time ... in other words, in most cases, you can't take a $5,000 a year item and transform the exact same item into a $15,000 a year item ... the item is what the item is! Inventory issues will crush a business that introduces 3x as many new items and generates 1/3 the volume per item. I'm guessing that you have some version of "Class Of" reporting to assist you in your understanding of merchandise productivity. If you don't have this style of reporting, contact me for an analysis!